My boss, Joe, walked me up to my office at the end of a long Sunday. It was a good but emotional day; My last as the youth pastor at Faith Lutheran Church. We stood in my office as Joe surveyed the carnage. It was clean (enough)… And yet still filled with a decade’s worth of youth ministry supplies that belonged to the church. I handed Joe my keys and credit card and we walked out of the building together. I expected to feel some semblance of relief. The decision to leave came after weeks (some might even say months) of gut-wrenching prayer. It came after I received an unexpected (and very good) job offer at another church that I’m genuinely excited by. 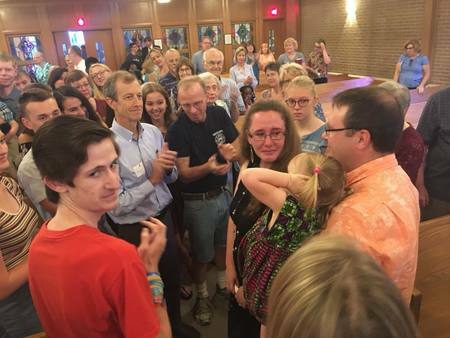 And yet, when I walked out of the church for the last time and realized I was done, all I felt was grief: Heart-wrenching, soul-sucking grief. Leaving a church job is unlike leaving any other kind of job. Not only does your schedule go from full to empty in a matter of minutes, but so, too does your social life. In one fell swoop, I lost trusted colleagues, friends, my church community, and the only faith community my daughter has ever known. I woke up the next day and felt untethered. Rather than feel elation at my three-and-a-half weeks off, I felt unglued. In the week since then, my grief has continued. Oh, there have been good days, too, don’t get me wrong. There has been laughter and joy and the discovery that the friendships that matter will continue. Really, truly, leaving a church job is unlike leaving any other because the relationships you have – with colleagues and parishioners alike - are deep. They’re rooted in the love of Jesus. But those don’t end… Even when a church job is done.